Microbial expression systems such as Escherichia coli (E. coli) are still a popular choice for biotherapeutic production. Lower manufacturing costs, high-productivity rates, and their FDA-approved status for human applications make E. coli an attractive, economical option for Fab, vaccine, and peptide hormone therapies. Over 30 E. coli-derived biopharmaceuticals are available on the market today. Although such products may entail a less expensive upstream manufacturing process, they must meet the same standard of assurance for product safety and efficacy as their mammalian cell culture counterparts. In the past decade, the FDA’s process analytical technology (PAT) and Quality-by-Design (QbD) initiatives have been major drivers for developing well-understood, robust processes for assuring reproducible pharmaceutical product safety and efficacy. Moreover, intense competition and changes in the economic landscape have facilitated the need to decrease product time to market through compressed process-development timelines. As a result of these factors, industry trends are moving toward the implementation of automated PAT strategies that are designed to bring analytics closer to the operation, eliminate gaps in real-time process monitoring, and develop a more rapid, deeper understanding of the bioprocess. Employing rapid culture characterization techniques is one tool that can be used for achieving a well-understood process while reducing process-development time. For upstream processes, a high return-on-investment can be quickly realized by implementing technology platforms such as automated on-line bioreactor sampling and biochemistry analysis for nutrient, metabolite, and culture metabolic monitoring. Through the use of these tools, real-time analysis and nutrient consumption rates can be attained to 1) quickly optimize biomass and productivity rates through greater carbon conversion efficiency, 2) reduce overflow metabolism, i.e., acetate production, which can inhibit cell growth and negatively impact protein expression and 3) enhance process-management system capabilities through expanded process monitoring and control functionality. To more rapidly characterize culture process parameters, obtain metabolic profiling, and quickly identify process shortcomings, i.e., nutrient limitations, a process systems’ connectivity approach should be used. In this study, we describe how this method was implemented during a media optimization experiment to attain glucose consumption rates and identify media nutrient limitations of an E. coli fermentation process in real-time. Connecting process systems requires two basic levels of integration: sample, or liquid, management and communication interfacing. Flownamics’ Seg-Flow® automated on-line sampling system (Seg-Flow) facilitates interconnectivity between the unit of operation (bioreactor), the analytical instrument (analysis), and supervisory control and data acquisition (SCADA) or data historian (data management). This interconnectivity permits a closed-loop solution for enabling aseptic sampling, automated on-line analysis and bi-directional communication, and control options between the various entities. Using the process systems connectivity approach, Seg-Flow allows a high degree of flexibility through multiple bioreactor, third-party analytical instrument and SCADA integration options. This, in turn, allows the end-user many plug-and-play options for creating an automated, on-line PAT platform using their existing process systems, regardless if a single bioreactor is used or a high-throughput platform consisting of multiple or parallel bioreactor systems. Additionally, a scale-independent PAT strategy can be achieved, allowing “gold-standard” analytics to be employed for real-time culture monitoring from lab to production scale. Although it is desirable to reduce the number and types of analytical equipment used for monitoring well-understood, robust manufacturing processes, certain culture parameters, i.e., nutrients and metabolites, will almost always require monitoring to prevent process deviations. 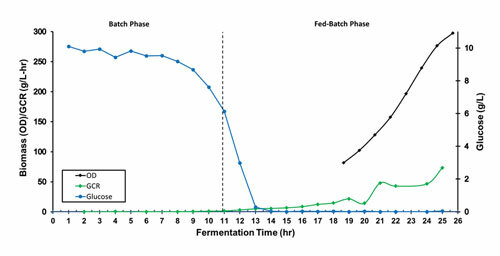 Overflow metabolism is an undesirable characteristic of E. coli fed-batch fermentation cultures that can lead to high acetate production and is a chief concern for manufacturing processes. Glucose feeding strategies not aligned with the culture glucose consumption rate (GCR) requirements can exceed carbon flux capacities of the cell’s tricarboxylic acid (TCA) cycle and not allow complete oxidation of acetyl-CoA. This results in the excretion of acetate, which, if excessive accumulation occurs, can inhibit cell growth, reduce productivity, and negatively impact product quality. Therefore, real-time metabolic monitoring can be invaluable in allowing the scientist to observe metabolic phenomenon, such as overflow metabolism, as it occurs as well as apply remedies, i.e., feed control adjustments, to better meet the production culture’s uptake needs. Additionally, the process systems connectivity approach is useful for process deviation studies, in which metabolic events can be induced and observed in real-time. Figure 1. Process systems connectivity approach for achieving real-time metabolic profiling of E. coli fermentation cultures. The Seg-Flow automated online sampling system permits seamless integration with any bioreactor vessel configuration and various third-party analyzers for enabling aseptic sampling, automated real-time analysis, and data-management options. 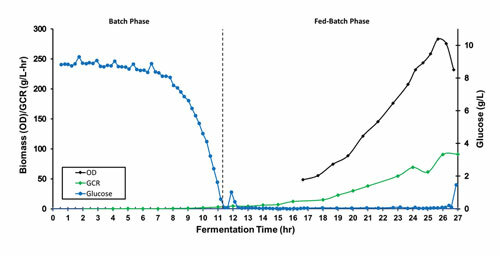 To rapidly characterize metabolic events for Scarab Genomics’ Clean Genome® E. coli production cultures, the process systems connectivity approach was implemented through the use of an integrated Seg-Flow system. A growth and carbon utilization study of two Clean Genome E. coli strains, A and B, respectively, was conducted using a biphasic high cell density fermentation process at 10 L scale. Cultures were grown to a specific density in minimal salts/glucose media during the batch phase. Upon reaching the targeted cell density, the fed-batch phase commenced in which glucose was fed exponentially to control the culture growth at a specified growth rate (μ hr-1). Strain A was cultivated for a minimum of 25 hours. Strain B, which was used to evaluate process limitations, i.e. nutrient expiry, was allowed to grow until stationary phase of growth was reached. Seg-Flow, integrated with an YSI® Biochemistry Analyzer, provided real-time analysis of media glucose concentrations at a minimum of one hour intervals. On-line samples were drawn from the vessel using a FISP in situ microfiltration sampling probe (0.2 µm) and delivered to the YSI analyzer for glucose analysis. Upon acquisition of the YSI glucose data, the Seg-Flow System calculated the culture GCR. Figure 1 shows the system configuration used for this study. Off-line samples were obtained for acetate analyses. Figure 2. Clean Genome E. coli Strain A. Real-time media glucose concentration and culture glucose consumption rate data are shown in blue and green, respectively. Culture density is displayed in black. Process duration was 25 hours. As shown in Figures 2 and 3, high-cell density cultures of Strain A and Strain B exhibited similar growth and glucose utilization profiles through hour 25. Peak cell densities were observed at hour 25 for each culture, with Strain A obtaining 212 OD and Strain B reaching 285 OD. Total glucose fed for each culture at hour 25 was 2000 g and 2100 g for Strain A and Strain B, respectively. Up through hour 25, the on-line GCR, on-line glucose concentration data, and off-line acetate concentration data (data not shown) affirmed that the total glucose fed and exponential feed rate for each culture did not produce an overflow metabolism event. However, a spent media event for Strain B was observed in real-time at hour 25. Although all Clean Genome E. coli strains are prototrophs, Strain A transitioned to a quiescence phase induced by limitation of elements in the media, other than carbon, as indicated by the metabolic shift observed through the reduction in OD and GCR and increased media glucose concentration (Figure 3). The process was terminated at hour 27 as critical nutrient expiration had already been reached. A process systems connectivity approach can prove invaluable for achieving a more comprehensive PAT platform by harnessing metabolic parameters, such as nutrient consumption rates and substrate concentration data, and integrating them into the larger bioprocess data scheme. This subsequently allows access to previously nonexistent big data, which can be used for accelerating process development, and, ultimately, cut drug development costs. Figure 3. Clean Genome E. coli Strain B. Real-time media glucose concentration and culture glucose consumption rate data are shown in blue and green, respectively. Culture density is displayed in black. Strain B was cultivated 27 hours to further characterize any process performance limitations. Cris Blattner (cblattner@scarabgenomics.com) is fermentation manager and Frederick R. Blattner, Ph.D. (fredblattner@scarabgenomics.com), is CEO and director of research at Scarab Genomics. Michael Biksacky (mbiksacky@ flownamics.com) is president of Flownamics. William Miller, product manager (will.miller@xyleminc.com) at YSI Life Sciences, is former director of product development at Flownamics. Next articleMusic in Your DNA and a New Species of Human?